Another Great Year in Point Hope: On to Seward! 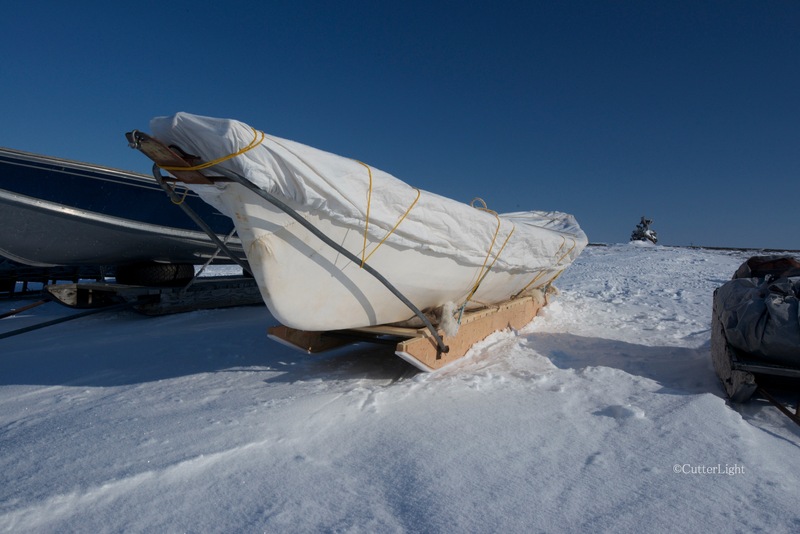 An umiak with its recently sewn seal skin stretched tight sits on the Chukchi Sea ice, waiting for whaling season to begin in March. May 17, Point Hope, Alaska: Near-blizzard conditions forced a one-hour delay to the start of school yesterday, the day before the end of our school year. A little snow and high winds notwithstanding, all 30 of our 3rd, 4th and 5th grade students eventually arrived. It’s much more calm today. Scattered snow flurries have been breaking up an otherwise sunny day, and at 19 degrees Fahrenheit, the McKay’s buntings and gulls that showed up a few weeks ago when the weather was warmer (in the low 30’s) are out again. Looks like clear weather for our flight out tomorrow. Near shore, the going is easy across the frozen sea. But the ice ridge on the horizon hints at the arduous work involved in breaking the trails that will allow whaling crews to get their boats and gear out to the lead (open water). This marks our third year in Arctic Alaska. We’ll be back for a fourth in August. We’re up here in Point Hope at a time in our lives when Time to study, Time to write, and Time to hone our skills as photographers, writers and chefs is especially valuable. Yes, it’s cold – brutally so at times-, and there is the entire month in mid-winter when we do not see the sun. But that’s part of the narrative. So are the dazzling displays of northern lights, the sublimely sweet cloudberries that grow only in these extreme latitudes, and the Arctic foxes, snowy owls, polar bears and whales that are part of the fabric of life up here. Learning to stock a gourmet kitchen in the bush nearly 1,000 roadless miles from stores in Anchorage has prompted us to master “from scratch” cooking to a level of expertise I doubt we would achieved had we remained in our comfortable bungalow back in California. A fresh dusting of snow powders ice sculptures that were pushed up when shifting winds caused massive plates of ice to collide. Anytime you’re out on the ice, you’re mindful that another shift in the wind could push the ice apart again, leaving you stranded. You learn to keep an eye on the cracks. By this time next week, we’ll be in Seward living aboard our summer home, the sailing vessel Bandon. Among other things we’re looking forward to is an intensive wine appreciation course we’ll be taking with another couple. We’re also eager to do some serious shooting with our new Nikkor 200-400 mm telephoto lens- a tool that should help us get intimate photographs of the amazing wildlife in and around Resurrection Bay. Daughter Maia will come up in July for our annual visit centered around fishing, hiking, great meals (and great conversation) and general catching up. The puzzles of turning out excellent meals from our small galley, figuring out where the salmon are in the nearby sea, experimenting with our new tenkara fly rods on smaller streams and maybe finally getting good photos of wary tundra swans are among other things that will keep us happily occupied in the coming months. A whaling hook marks the trail out to the camps. 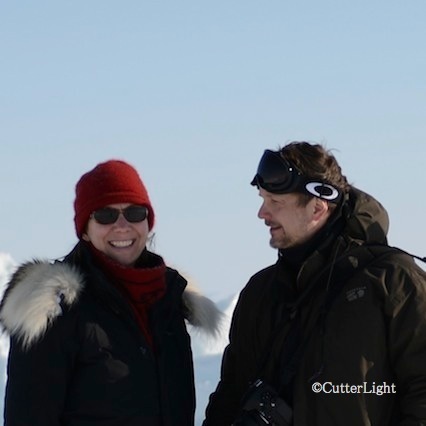 This was a good year in Point Hope – five bowhead whales, lots of beluga whales, and everyone came back safe. Each whale represents tens of thousands of dollars worth of groceries that didn’t necessitate a river being drained for irrigation, fertilizer being spread (that ends up over-nutrifying nearby water systems), or a single drop of pesticide being sprayed. Nor were barrels of fossil fuel burned getting this food up here. An important part of our summer in Seward involves seeing to our own provisions. When we return to Point Hope in August, we’ll bring with us 200 pounds of salmon, halibut, rockfish and lingcod fillets – enough for us and for gifts for our friends up here. We’ll also be making shopping runs to Costco and other stores and ship up the usual bags of flour, rice, beans and sugar as well as everything from jars of Kalamata olives to tins of anchovies. Wherever this summer finds you, we hope you’ll be following your dreams or taking steps to make those dreams come true. And we hope you’ll continue reading CutterLight. We enjoy following your adventures via your blog. Be well. Thanks Ann and Jerry. Now all we need is some summer weather. It’s only 28 in Anchorage as I write this! Can’t wait till you are here! Barbra – I wish you were taking EDET 635 this summer :(. I’ll check your blog for your summer adventures. Are you going to be taking courses this winter? Hope to connect with you in class or at ASTE again in February – have a fantastic summer! Hi Tracie! I’m in EDET674 now and have to take the research class in the fall. Then only two more to go! I am planning to go to ASTE again. I hope we connect in class again, too. Either way, let’s keep in touch! Have a terrific summer! Hi Cass, In Alaska, the most common gun used for bear protection is probably a pump action 12 gauge loaded with slugs. I love that picture of you two. Very sweet. We were recently surprised to see just how few photos we have of the two of us. We’re going to press Maia into service to get a few shots when she visits this summer. Speaking of which, hope yours is terrific! 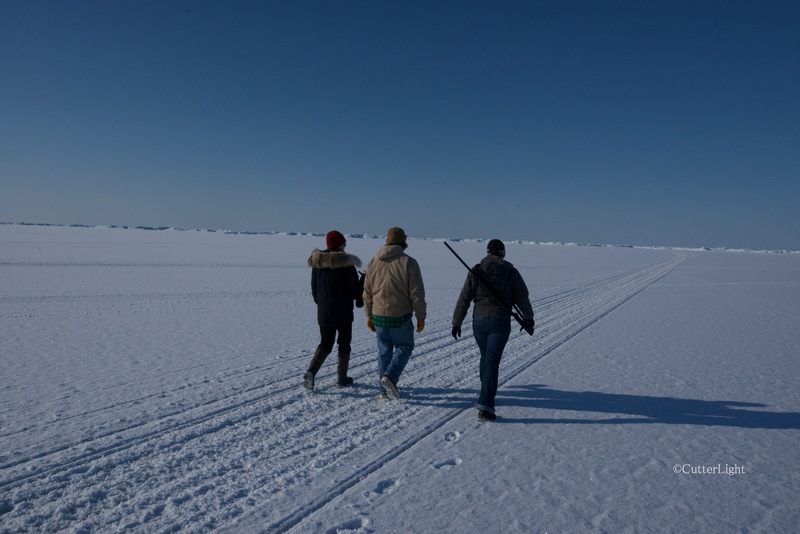 The ice is quite thick, and we stay on established trails. 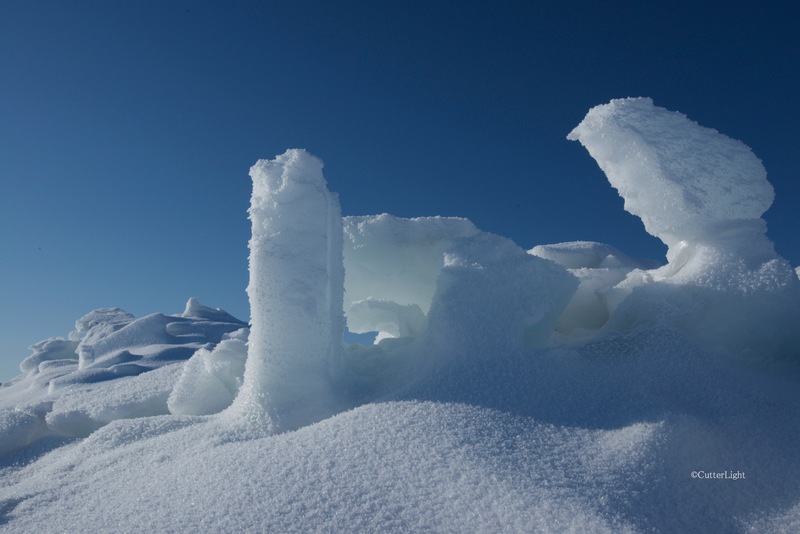 It is important to pay attention to wind direction (which can push ice apart) and to stay alert for polar bears. For some photos of the northern lights, type that in as a search term on our site. As our photography skills continue to improve, we’ll be publishing more lights in the coming months.